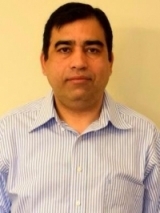 DC CFAR Investigator, Mudit Tyagi, PhD, has recently been awarded an R01 from the National Institutes of Health entitled, "Characterization of Cocaine Induced Signaling Pathways That Enhances HIV Transcription". This study seeks to further explore the cocaine induced signaling pathways that affect HIV replication. The researchers intend to study the molecular mechanisms involved in this process by analyzing the effect of cocaine on monocyte derived macrophages MDMs from HIV infected cocaine addict patients. Specifically, they will evaluate the impact of cocaine activated signaling pathways that induce different enzymes and promote both initiation and elongation of HIV transcription by catalyzing phosphorylation of histone H3 and NF-kB. The hope is to lead toward the discovery of new mechanisms that regulate HIV replication in the context of drug abuse, and therefore a better understanding of these mechanisms, which in turn could reveal new drug targets and open up avenues to design better diagnostic tests and treatment strategies for both HIV and addiction.